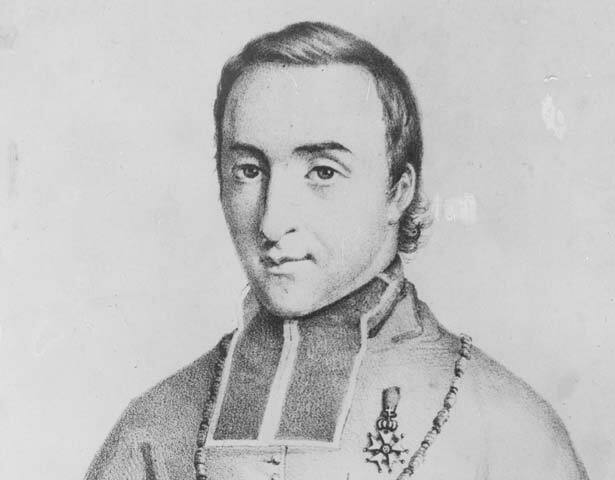 Bishop Pompallier was born in Lyons, France, in 1801. He was consecrated Bishop with responsibility for Western Oceania (including New Zealand) in 1836. He arrived in New Zealand in 1838, and by the mid-1840s had established a number of Catholic missions. By 1843 the French missions claimed about 45,000 Maori converts. The position of the French mission was precarious. Relations between Britain and France were tense at this time, most British settlers were hostile, and the English Church Missionary Society was making inroads. These difficulties were worsened by isolation, lack of resources, and disruption caused by the wars. Most of the French missions failed – except in the north, where a Catholic influence was maintained. Pompallier was sympathetic to Māori concerns, and for his time, he had an enlightened view towards Māori culture. He was at Waitangi when the Treaty was signed on 6 February 1840, and asked Lieutenant-Governor Hobson for his promise to protect the Catholic faith. This pledge is sometimes referred to as the unwritten "fourth article" of the Treaty, and is said to protect and recognise not only major western religions, but also Māori custom. We have 13 biographies, 5 articles, 1 comment related to Jean Baptiste Pompallier.